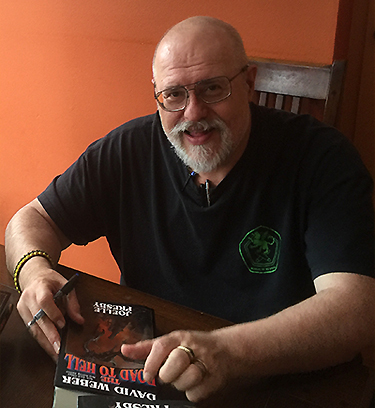 An avid tabletop gamer (who, alas, no longer has room in his schedule for his hobby, he's wargamed every era from ancient Rome to World War II armored conflict, and began RPG playing with Gary Gygax's Chainmail rules in 1972. His younger sister went on to become a hand weaver and his younger brother was a production Potter for thirty years, so it's probably not too surprising that from that start he would find his way into the world of science fiction and fantasy rather than pursue honest work. He sold his first novel to Jim Baen at Baen Books in 1989. Since then he has published 66 solo and collaborative novels (two more will release in October 2018 and January 2019, and a third has been delivered but not yet scheduled). He has also edited six anthologies and appeared in several more. He is best known for his Honorverse, with 26 solo and collaborative novels in print (the twenty seventh, Uncompromising Honor is an October 2018 release from Baen Books) centered around his character Honor Harrington and her universe, and the Safehold series, with nine novels in print (the tenth, Through Fiery Trials, is scheduled for January 2019). He still lives in South Carolina with a wife, Sharon, who he is fortunate loves him enough to put up with him, their three children, two dogs, and six cats. And, as Sharon is fond of saying, don't get him started talking if you expect him to ever shut up again. Pre-register now to save $10 off your at-the-door price!